CAGUAS, Puerto Rico (CNS) — The only way a military veteran who works for the Diocese of Caguas could get a message out from Puerto Rico to contacts elsewhere illustrates conditions in Puerto Rico nearly three weeks after Hurricane Maria made landfall on the island Sept. 20. “He sent the email from his car in the mountains — the only place where he can charge his phone and get some periodic reception,” reported Joe Boland, vice president of mission at Chicago-based Catholic Extension. He got word from the veteran “that they have armed guards at gas stations. Communications and transportation are still a mess,” Boland said in an email sent to Catholic News Service in Washington Oct. 10. After surviving the devastation wrought by Maria, Bishop Eusebio Ramos Morales of Caguas finally reached a functioning land line at one of his parishes and the first phone call he made was to Catholic Extension. The bishop reached Boland and described the island of 3.4 million people as being in a total state of chaos. He said the Catholic Church was paralyzed due to the inability for anyone to travel or communicate. He reached out, hoping that Catholic Extension could help in some way. 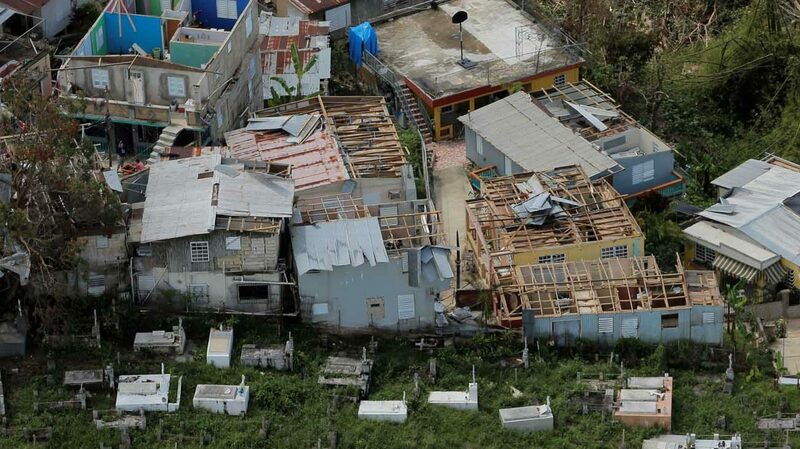 A week after Maria hit, Catholic Extension was able to send $325,000 in relief funds for the six dioceses of Puerto Rico, with another $25,000 going to the U.S. Virgin Islands, which were hit by hurricanes Irma and Maria. Catholic Extension is a national fundraising organization that helps build churches and supports church ministries and other efforts in U.S. home missions. It has had a decades-long relationship with Puerto Rico. It first assisted the Archdiocese of San Juan with a church-building project in 1908. Other agencies that have provided aid include Catholic Charities USA, which sent $1 million in emergency aid to Caritas Puerto Rico, and the Knights of Columbus, which has sent $100,000 in aid. As of Oct. 10, just 16 percent of electricity service had been restored. At an Oct. 6 news conference, Gov. Ricardo A. Rossello told reporters officials expected to have 25 percent of the electrical system restored “within the next month.” About 67 percent of cellphone towers remained down. Most Puerto Ricans are still struggling to get basic necessities — food, water, fuel, medicine, currency — and several relief organizations continue to face obstacles getting aid to those who need it most because of fuel shortages, and a majority of the roads are in ruins. The New York Times reported that only 392 miles of the 5,073 miles of the island’s roads are open. At least 43 people have died as a result of the hurricane; officials said that number could rise as communication systems improve. Archbishop Roberto Gonzalez Nieves of San Juan announced at a news conference Oct. 10 that the Catholic Church in Puerto Rico has already helped with food and clothes at least 50,000 affected by the Hurricane Maria. As a result, it has been difficult for dioceses to assess the extent of damage to church property. The organization is accepting donations at www.catholicextension.org/give/hurricane-support, with the amount to be matched dollar by dollar by some of Catholic Extension’s longtime donors. Health care workers continue to sound the alarm about dire conditions and countless numbers of residents they say are still in desperate need of assistance. Brock Long, administrator of the Federal Emergency Management Agency, said 16,000 federal and military assets are on the ground in Puerto Rico and about 350,000 Puerto Ricans have registered so far in the FEMA system to receive financial assistance.